Plastique gets denied a high five in this week’s issue of The New 52: Futures End! This issue opens up with a powerful moment between Amethyst and Frankenstein — two characters that have been responsible for some of the greatest scenes/dialogue of the series. This scene shows how all the writers involved have been able to create a strong relationship between two characters even while dealing with so many others each week. And Frank’s words are as poetic as ever. 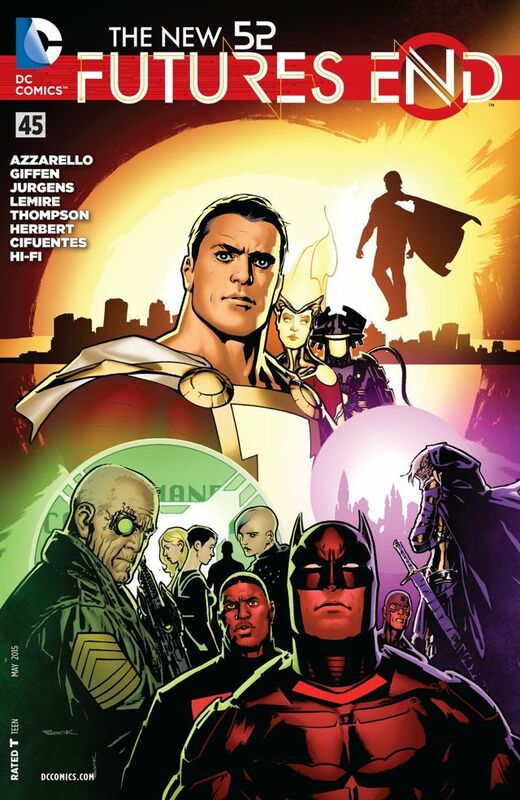 Writers Brian Azzarello, Jeff Lemire, Dan Jurgens, and Keith Giffen take this week to rid the streets of New York of one titan of a villain, only to put the citizens back in peril with the emergence of another — one Terry came back to eliminate! On the artwork side of this week’s issue is penciller/inker Stephen Thompson along with penciller Jack Herbert, inker Vicente Cifuentes, and colors by Hi-Fi. A great panel this issue comes when Firestorm is seen flying through the city, the cars rushing underneath her. The detailing work in this panel is excellent and even the panels at the top of the page (Superman throwing something into the sun) blends into the fire of Firestorm’s trail during her pursuit of Dr. Polaris. By the end of the page Jason convinces Firestorm that Polaris can wait, the real best use of their powers right now is helping save the civilians effected by Brainiac’s attack. This issue hits a high note right from the get go with the final look into the relationship of Amethyst and Frankenstein. Back in New York, Brainiac’s presence is being cleaned up…but did getting rid of one enemy just make room for another?